I have been meditating on James Baldwin’s “Talk to Teachers” these last few weeks. People. In case you’ve forgotten, the man can WRITE. 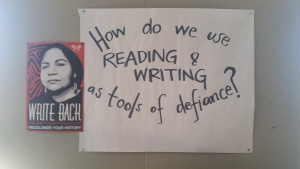 Although it is a very challenging text, I wanted to use this text as a mentor text to help my students address one of our year’s essential questions: How might we use writing as a tool of defiance? I owe a debt of gratitude to a member of my PLN, Jessica, who, in a thoughtful and prescient blog post, suggested that we frame powerful writing as powerful resistance. I am centering my writing coaching this year around the idea that we can and should use writing as a way to resist and reimagine anything that threatens our humanity. So, naturally, I have been reading Baldwin.